This icon shows Christ the Teacher seated on the holy mountain with a scroll in his hand and his right hand extended in a gesture calling people to listen. He is surrounded by the 12 apostles and by men and women, adults and children of every race and nation. Seated in the foreground is St Ignatius Loyola (1491-1556), founder of the Society of Jesus and of Jesuit schools. 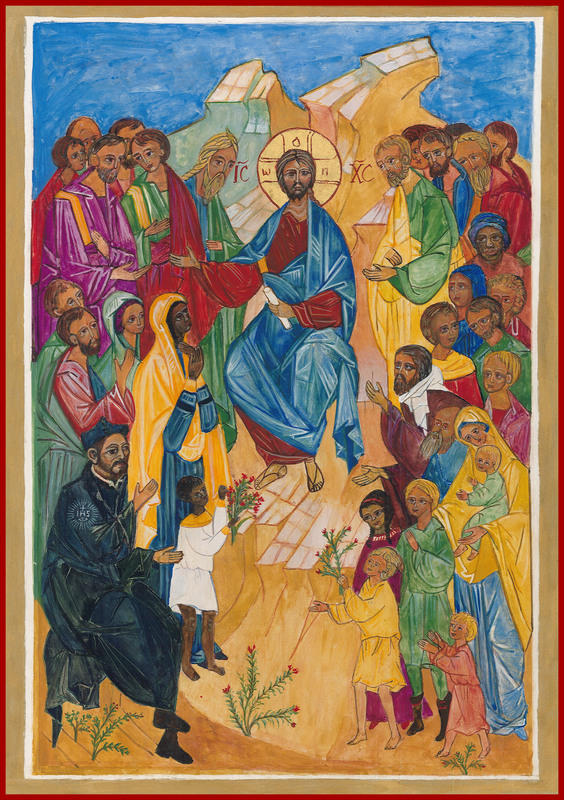 This icon was created for the Jesuit schools of the British province. There are extensive explanatory notes on the iconography of the image. Posters and prayer cards are also available. This poster is also available from the Jesuit Institute. The copyright of this image is owned by the Jesuit Institute London. The image may be freely used in Jesuit schools and parishes for teaching, assemblies, liturgy and retreats. If you wish to use it in other contexts or in print, please contact us for permission. Thank you.